This page will introduce two different ways to resize system partition when Windows Server 2008 says low disk space warning message. Download IM-Magic Partition Resizer Server to expand system partition when disk management cannot extend the partition on Windows 2008.. If you run into the problem that system partition is running out of disk space on Windows Server 2008, you have two choices to resolve the problem on Windows Server 2008. Firstly, you can run Windows 2008 built-in disk management to extend the system partition. Secondly, you can rely on the partition software to resize hard disk on Windows Server 2008. Usually, disk management has some limitations when you want to resize disk partition, while professional partition software is much more effective to extend partition size. 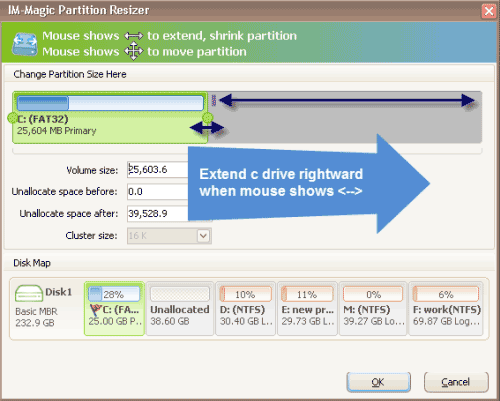 IM-Magic Partition Resizer Server is a professional partition software for Windows Server users to resize hard disk, so you can use it to expand the size of system partition when disk management failed to extend it on Windows Server 2008. You can move the arrows to extend the system partition and then "Apply" button. "Today when I started my computer, I received a warning message that C drive (system partition) is running out of disk space. My computer runs Windows Server 2008 system. Then, I went to Disk Management and wanted to manage the disk space. I found that there is only little free space on C drive. I tried to move some free space from other partition, but failed. 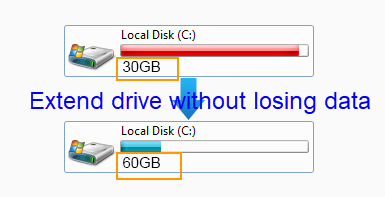 First of all, I selected D drive and choose Shrink Volume to squeeze some free space from this partition. Then, I right clicked C drive but the Extend Volume option is grayed out, so I cannot add the free space squeezed from D drive to the C drive. Is there any other way to extend the system partition on Windows Server 2008?" "I want to extend system partition on Windows Server 2008. Can somebody tell me how? If your advice is to run Disk Management, I am sorry it is not useful. I have tried this method but failed. Please tell me any other useful way to increase the size of system partition. Thanks!" How to Extend System Partition under Disk Management in Windows 2008? After opening Disk Management, you can see all partitions. You need to select a partition that has much free space. Then, right click this partition and choose "Shrink Volume" option so that you can squeeze some unallocated space from this partition. You need to move the unallocated space close to system partition in order to add the space to the system partition. The bad news is that Disk Management is unable to move partition. Probably, you need to delete the partition (s) between the system partition and unallocated volume. After moving the unallocated space close to system partition, you can right click the system partition and choose "Extend Volume" option so that you can add the unallocated space to system partition to get it extended. Pay attention: If the unallocated space is not adjacent to the system partition, the "Extend Volume" option will be grayed out and you cannot extend partition on Server. Another solution for Windows Server 2008 system partition expanding is to rely on the partition software. The partition software has the similar functions with Disk Management, but it does no limitation. By using this partition software, you can shrink volume, move partition and extend partition easily and effectively without changing or hurting any information stored on the disk. In addition to work on Windows Server 2008, you can also use this partition software to extend system partition on Windows Server 2003 2012, SBS 2003, SBS 2008, etc.